This is the salad I made to accompany the Citrus Herb Chicken for my friend’s birthday dinner. It’s light but filling and was a great side for this summer meal. Preheat the oven to 350º degrees. In a small bowl, whisk together the olive oil, white wine, orange, and lemon juice until combined. Season with salt and pepper to taste. Remove the outer leaves from the Brussels sprouts. Reserve the cores for another use. Place leaves on a baking sheets and drizzle with olive, and sprinkle with salt and pepper. Bake for 10 mins. In a small frying pan on medium heat, toast the pine nuts until golden brown and you can smell them. About 5 mins. Do not walk away from them. They burn quickly. 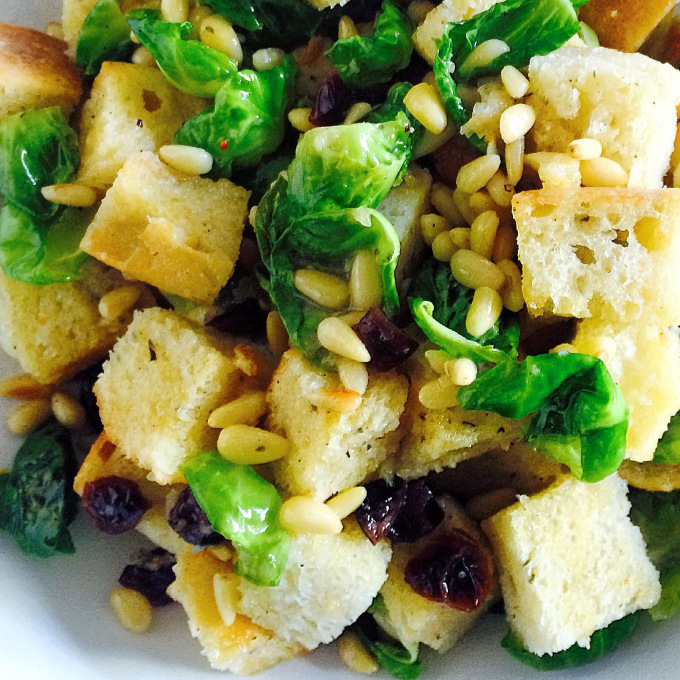 In a large salad bowl, mix together the croutons, brussel sprouts, and cranberries. Add the dressing. Toss until all ingredients are coated with the dressing. Sprinkle toasted pine nuts on the salad. This salad has equal parts of bread and vegetables so it makes for a nice side to go with fish or chicken. This salad does not keep, so make what you need as leftovers will be soggy and wilted.